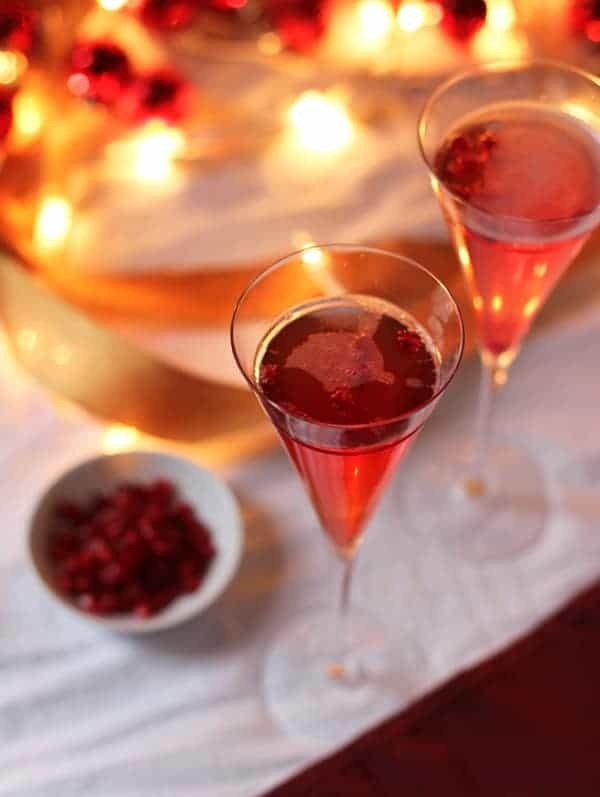 A delicious and festive cocktail made with sparkling wine, Cointreau, and pomegranate juice. Perfect for holiday parties. The Holiday Season is officially here (wohoo), and along with that comes the decorations, music, lights, shopping, and my favorite part, the holiday parties! Parties filled with good friends, good food, good wine, and holiday cocktails. Now we all know sparkling wine is one of my favorite beverages, but this time of year I like to jazz up my bubbles with champagne cocktails, and Pomegranate Mimosas have become one of my favorites to share this time of year (thanks to a good friend who introduced me to the idea years ago at, yes, a holiday brunch). First of all, pomegranates are in season right now, and second when I think of the typical orange juice mimosa I am reminded of brunch, so this is the perfect alternative for not only a holiday brunch, but also a cocktail party. It is festive. It is beautiful. It is delicious. It is bubbly. What more could you want? Your first option is to use a fresh pomegranate and seed it. But be warned, they can be very messy and are prone to shoot fast bursts of deep colored red juice on your clothes or in your eyes, so cover up with an apron and work slowly. However, if you live near a Trader Joe’s you can trade in the fresh pomegranate for a pre-seeded container. They cost about a dollar more than a whole pomegranate and all the work is done for you. Voilà. Now let’s mix. 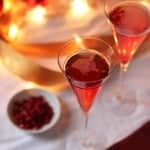 Pour pomegranate juice and Cointreau into a champagne flute. Eyeball how much you want. If you like it sweet add the full 1 oz. of juice. If you like it less sweet, add less juice. Top glass with sparkling wine. Add pomegranate seeds for garnish. (If you don’t have Cointreau then orange juice may substitute, although I will often omit the Cointreau all together if there are no alternatives available). One of my favorite things about this drink is that it is simple and different. It’s not your typical mimosa; it is very festive and as easy to make as mixing orange juice and sparkling wine together. When selecting the sparkling wine I recommend using something dry (or brut) so that you are in control of how sweet the end product is. You don’t have to choose an expensive wine either. A good value option Cava from Spain. It is one of my favorite bubbles for mixing in mimosas or other Champagne cocktails. *Tip: If you have guests at your party that do not drink wine, just substitute sparkling water, soda water, or lime flavored soda and just add extra pomegranate juice. You could even try sparkling cider instead of wine. Most importantly, try them for yourself this holiday season. You may even impress your friends. wholly smokes, you just inspired me! This gives me something new to drink for breakfast. I LOVE YOU! can’t wait to read more. Josh, I’m so glad you liked the idea. And yes, they do make for a great breakfast treat 🙂 I nope you enjoy.